If you're healthy, and don't have high cholesterol or cardiovascular disease, you can eat up to one egg daily, according to the Harvard School of Public Health. You'll have to skip eggs for a day after eating a two-egg omelet, but calories shouldn't be a problem. As long as you don't get carried away with high-calorie fillings, a two-egg omelet probably has fewer calories than you think. The calories you'll get from an omelet increase as the eggs pick up some of the fat you use in the pan, so use as little fat as possible. 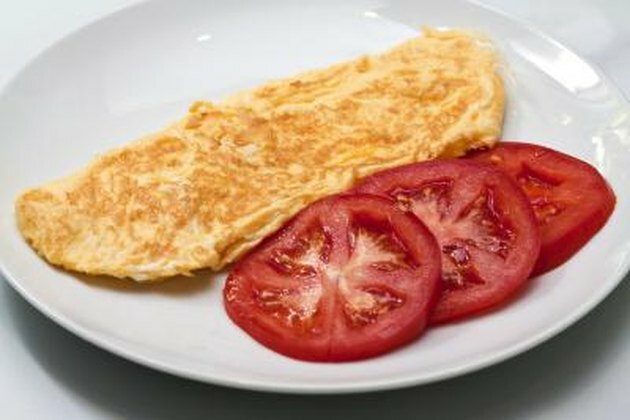 For example, a plain, two-egg omelet has about 43 more calories than two raw eggs. As a general guideline, plan on getting 188 calories from two large, whole eggs cooked into an omelet. They also contain 12.9 grams of complete protein, which is 28 percent of women's recommended daily allowance, and 23 percent of men's. You can also count on getting at least 10 percent of your recommended daily allowance of iron, folate and vitamins A, D and B-12. Two eggs cooked into an omelet have 14 grams of total fat. If you're tracking your fat intake, you'll need to know that this amount accounts for 126 of the total calories. The total fat includes 382 milligrams of cholesterol, which is over the recommended daily intake of 300 milligrams established by the American Heart Association. You won't have to worry about the cholesterol or calories from fat if you make the omelet using egg whites because all of the fat is in the yolk. Cheese adds protein and bone-building calcium but it's also high in calories. You'll get roughly the same amount of calories from all types of hard cheeses. If you use one slice, or 1 ounce, of cheddar cheese, you'll add 113 calories. However, a reduced-fat cheddar drops the additional calories to 65. This means that your two-egg omelet is now up to either 253 or 301 calories, depending on the type of cheese you use. Three hundred calories should fit into your daily diet unless you're following a very calorie-restricted eating plan. It definitely works for breakfast, which should include 350 to 500 calories, notes "Go Ask Alice" from Columbia University. You can pile on non-starchy vegetables without worrying about calories. A generous serving of onions, peppers, mushrooms and tomatoes only has 10 to 25 calories. Don't go overboard if you add potatoes because half of a medium-sized potato adds 55 calories. If it's not breakfast without some form of meat, go with reduced-fat or vegetarian options. One ounce of vegetarian or Canadian bacon only has 50 calories, while turkey bacon goes up to 107 calories and the same portion of pork bacon has 254 calories. How Many Calories Are in Scrambled Eggs? How Many Calories Does a Hard Boiled Egg Have?